Western governments and supportive media go along with the deception, part of the diabolical plan to let Israel get away with mass murder and much more. Since creation of the Jewish state, Palestinians have endured virtually every form of indignity, degradation, and crime against humanity imaginable. The world community consistently fails to hold Israel accountable for crimes against humanity. Occupied Palestine is an isolated prison, besieged/densely populated Gaza the world’s largest open-air one. An entire population is being suffocated out of existence – a process Francis Boyle and Ilan Pappe call slow-motion genocide, ongoing for decades. There’s not a sign of relief for one of the world’s most aggrieved people. Israeli viciousness is unrelenting. Overnight Sunday and Monday into Tuesday, Israeli violence is the latest example of its undeclared war on Gaza. When Palestinians legally respond in self-defense, they’re falsely accused of terrorism. The US and other Western countries support Israeli high crimes, calling them self-defense. Virtually defenseless Palestinians throughout the Territories are up against nuclear armed and dangerous Israel, its military one of the world’s most formidable, especially its sophisticated airpower. The Trump regime is more one-sided for Israel than any of its predecessors, contemptuous of fundamental Palestinian rights. Through its embassy in Israel, Canada expressed “full solidarity” with the Jewish state – demanding “Hamas…immediately stop targeting civilians,” ignoring IDF terror-bombing. It’s been more intense than any time since Israeli aggression on Gaza in summer 2014, civilians always harmed most. The Jewish state considers them legitimate targets – even infants, young children, women, the elderly and infirm. They’ve been killed, dozens wounded in Israel’s latest state terror attacks on the Strip. Palestinian media reported that aerial attacks and ground shelling continued ferociously overnight Monday. Israeli warplanes targeted a college in Tal al-Hawa, a Gaza City hotel, leveling the five-story structure to the ground and damaging surrounding buildings, the Al-Aqsa TV station struck to silence its reporting about the carnage, as well as at least six multi-story buildings, and numerous other sites. 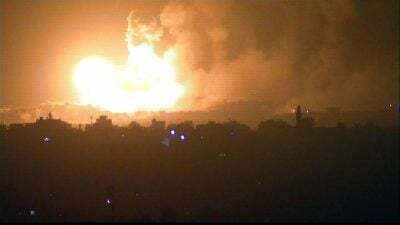 When Gazans responded to Israel’s hostile overnight Sunday commando raid, killing seven Izz al-Din al-Qassam Brigades members of Hamas’ armed wing, ferocious Israeli terror-bombing began – intensified when Gazans fired a reported 300 crude homemade rockets at Israeli territory. An Israeli bus and apartment building were struck, one person reported killed, several others injured. Israel bears full responsibility for what’s going on like all previous times when violence erupted. The vast majority of Palestinian rockets land harmlessly, some intercepted by Israel’s Iron Dome defense system. Many don’t explode on impact. Direct hits on Israelis or structures are rare. Rockets are short-range and imprecise – polar opposite massive Israeli air and ground firepower. Its warplanes and ground-to-ground IDF missiles use laser guidance to strike targets with precision. Israel’s medical service said 23 Israelis were treated for light injuries from shrapnel and smoke inhalation. Two others were critically wounded, one person killed. On Tuesday, the Netanyahu regime’s security cabinet will meet to plot its next move, intense violence likely to continue. UN Secretary-General Antonio Guterres ignored Israeli aggression, urging the Jewish state and Palestinians “to exercise maximum restraint,” pretending both sides are equally matched, a shameful remark like many times before, showing dismissiveness toward long-suffering Gazans. EU envoy to Israel Emanuele Giaufret was just as contemptuous, demanding a halt to “indiscriminate” rocket fire on Israel – ignoring IDF terror-bombing and ground shelling. IDF spokesperson Brig. Gen. Ronen Manelis said reservists are being ordered to active duty, calling them “vital forces, and if needed we’ll expand that” – perhaps indicating escalated conflict ahead. Separately, the Netanyahu regime said it’s not discussing a possible ceasefire. Once Netanyahu security cabinet members meet, more information will likely follow on what’s coming next.